(P1) Scientists now know the secrets to one of the world’s least understood fish, the seahorse. Researchers worked out the genetic map of the tiger tail seahorse. Scientists can now find out why seahorses are so different to other fish. They have no teeth. Male seahorses carry babies and give birth to them instead of females. 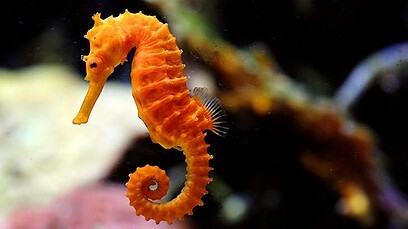 Also, seahorses do not swim forwards and sideways like other fish; they swim vertically (up and down). (P2) Seahorses started to get their unusual shape about 100 million years ago. They began to look like the neck and head of a horse. There are 54 different seahorses. The scientific name for a seahorse is Hippocampus. This word comes from the Ancient Greek words hippos (‘horse’) and kampos (‘sea monster’). Do you think seahorses are beautiful fish? Why or why not? Have you ever seen a real live seahorse? If yes, where? If no, would you like to see one? Are fish common to have as pets in your country? Why or why not? What’s the name of the type of seahorse that scientists studied? Which seahorse gender gives birth to babies? How long ago did seahorses get the looks of a horse? What is the greek name for a seahorse? i want to practice my english and i want to study abroad some day.